Become aware of all that is around you. As you cultivate awareness every day you awaken your senses, your intuition and your animal instincts. When you are attentive to everything that is happening to you and around you and within you, you can become a master of awareness. Some call this becoming a master of your animal energy, your animal medicine. 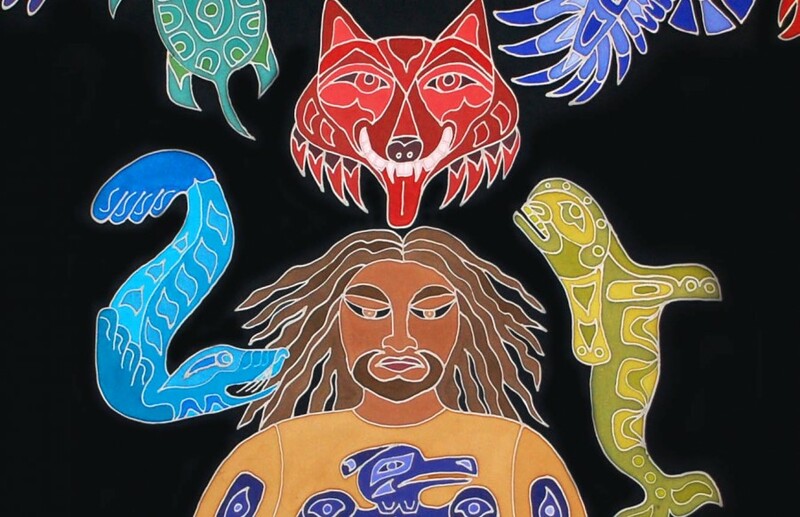 The figure above, an Inuit Shaman from Megan’s 13th sacred robe, helps you to honor and respect your instinctual awareness and to engage consciously with all the energies around you. One way to cultivate awareness is to observe the energy that other people are giving you, placing onto you or throwing at you. To master awareness you must also see the kind of energy that you are projecting onto others. This could be anger or love or sexual energy or manipulative energy. When you don’t want to have full awareness and you want to stay numb, your awareness instinct falls asleep and you cannot respond effectively to your environment. What would happen to an animal if it lost its instinct of awareness? Would it survive? Not for very long. An animal is alert to its surroundings, to dangers and to the energies present in its immediate environment. This protects the animal from harm and steers it in the direction of food, safety, warmth and everything that helps it thrive. I’m not talking about the hyper-vigilant awareness that plagues you with stress. I am speaking of your natural alertness that protects you from harm and helps you to thrive. Your animal awareness keeps you engaged in the energies of life and helps you to dance gracefully with whatever is coming at you from the environment or from within you. For example, if an internal or external criticism energetically zaps you and you freeze with fear, how might you engage with this energy rather than freezing? The Shaman above would dance with the energy, not run or hide or stay frozen. With the power and agility of the animal energy you can move, leap, soar, play, crawl, slither and smell what this critical voice really is. You can face the fear or leap over the attack. Playing with your animal, instinctive awareness gives you more choices in the face of fear, old patterns, inner voices and outer attacks.